Hi everyone. 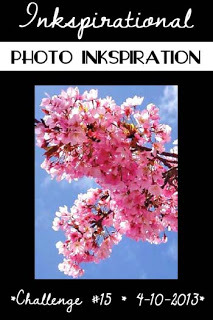 The card today is for two challenges ... another entry for the photo inspiration at Inkspirational ... and also SCS Way's To Use It (WT422 - window card). I stamped the image in Staz-on black ink onto watercolor paper and colored it with my blender pen and inks. I used a sponge to add Bashful Blue ink to the background and then blended it into the watercolor paper with my Aqua Painter (it's very faint blue and hard to see in the photo). I sponged the embossed white paper with Soft Suede ink. And the window frame is two layers (glued together) of white cardstock and then I dragged my Soft Suede ink pad across the window die to give it an aged look. The sentiment was stamped in black ink, using my Stamp-a-ma-jig for placement, before adhering the embossed panel onto the card front (popped up). The window frame is also popped up for added dimension. Labels: all occasion, CAS, CAS mixed media, marker layering, poppy stamps, sizzix, Stampin' Up! Loll, I love how you sponge and it looks so beautiful. Somehow when I sponge it looks dirty! I need a lot more practice. I hope that will improve the technique! This is so pretty and realistic looking with the brick wall. Love it! Beautiful!! Love the antiquing of the window frame and the colours on the brick. You and I both went with cherry blossoms for the SCS window challenge - how could we not, living where we do?!! ANOTHER beautiful entry! That cherry blossom is beautiful and the brick wall is stunning. Great combination. So glad you joined us at Inkspirational! gorgeous Loll! 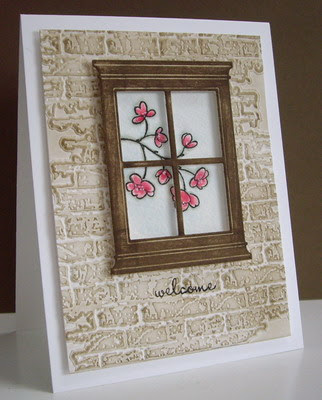 Beautiful wood finish on your window and what an awesome take on the challenge... love your cherry blossoms and brick! Gorgeous card Loll. I love the peek through the window to the outside. Have a great day. Wow Loll, another fabulous CAS creation for us at Inkspirational! I've had to buy a few things after seeing them on your wonderful cards - I'm happy to say I already have a window die and the brick folder - thanks for the inspiration to get them out and use them again! Loll this is fantastic! I love that brick wall. I'm going to see if I can find that folder! 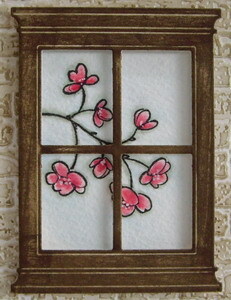 Your cherry blossoms through the window are so pretty, and I especially love how your window frame looks wooden. The Soft Suede is perfect for it. Thank you for playing along with us at Inkspirational! I love the use of the brick wall and window frame, it's really great. Congrats on the top 5.